You have all been asking and waiting for this announcement and it is finally here for the community to get first access. Please understand that all the specifications will be shared as we get closer to the official launch of the investment app v.1. Staking utility. 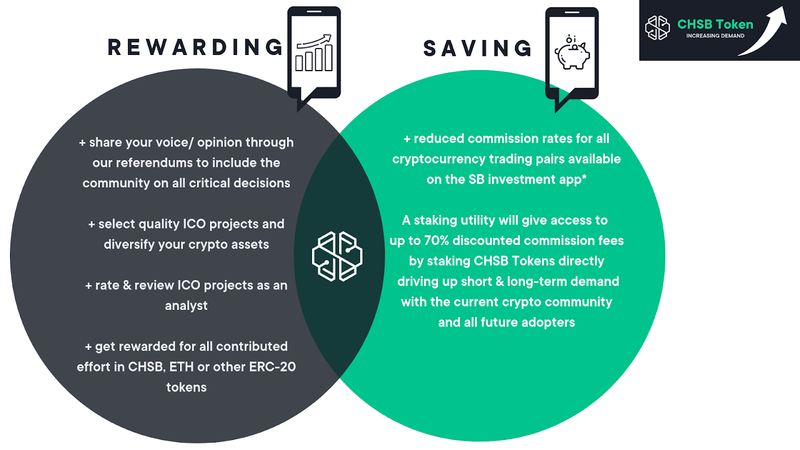 Each user will have access to discounted commission fees by staking CHSB Tokens. (Up to 70% discount). This powerful utility is only feasible for the companies that actually own all the back-end tech and are not “white labelling”. 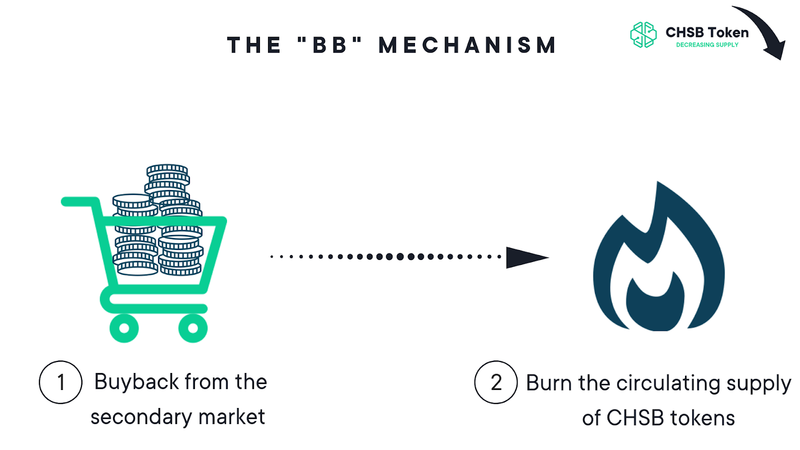 The CHSB Buyback Burning Program is the last part of the equation on, what we believe to be, a successful token economy. In macroeconomics, the law of supply and demand is one of the fundamental drivers and “backbone of the entire market economy” which will equally translate very well to our own token economy. Simple mathematics: (-) Less supply and (+) more demand = rise in value. The amount of CHSB token burnt is calculated in real-time based on revenues generated by the network as well as the level of community contributions. For example, we will share objectives with our community, such as reaching 100,000 new users for the next 3 months, that will increase the CHSB burning rate as soon as these objectives are reached. The Staking utility was decided after thorough research on successful token use cases and utilities with clear track records among all crypto assets. One of our key inspirations comes from the Binance (the BNB token) since this innovative token model has made Binance the leading crypto exchange with an estimated 2–4 million USD of trading revenue in a single day, constantly ranking #1 for 24h daily trading volume. We are dedicated to further innovate the CHSB token utilities and already have an unseen utility that will need a proper feasibility study before releasing further information. The question now is “How can we achieve this together, hand in hand with the community? We will need to have community challenges allowing us to turbocharge/ fast track progress. By getting you, a believer in a new and inclusive financial world to help us with small actions so that eventually the SB ecosystem will no longer be just community-centric but community-owned, which is one of our biggest visions. Give back to the community!! A portion of the fees paid at each transaction (revenue or profits*) will automatically be returned to the CHSB token holders through a buyback/burning mechanism. 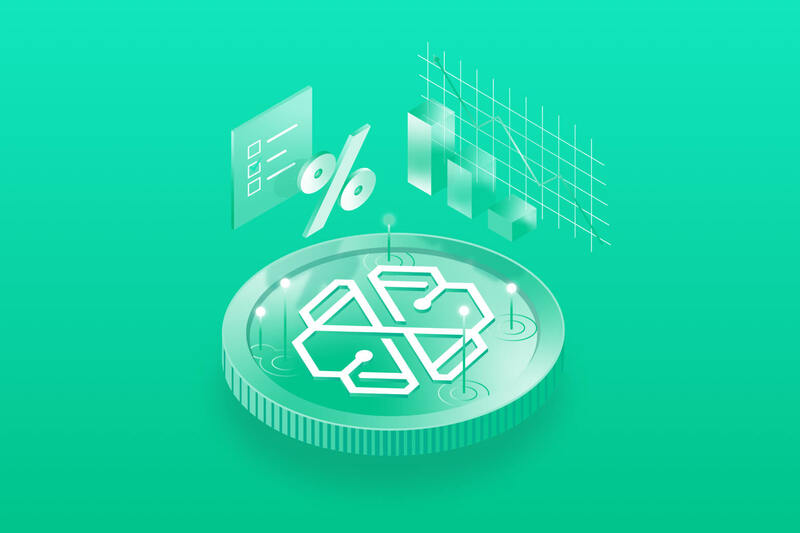 Simply put and in order to give back to the community, here is the following sequence: A) SwissBorg makes X amount on transaction fees B) we buyback CHSB tokens from the secondary market and C) decrease the circulating supply by burning the tokens immediately after. Spreading the word! All the marketing expenses/costs saved thanks to the community members. Rather than cramming advertisements down the throats of people, we, as a community can generate organic growth in a much more effective way. As a result, each member could strongly influence the value of their CHSB by sharing the vision and great potential of this movement. Near the V.1 launch, our community will be able to follow the CHSB burning rate level and other token metrics in a public /real-time dashboard as a visual reminder to further stress the scarcity effect (similar to a “countdown clock”) and the constant decrease in supply. We believe that this approach will not only really maximize the urgency of purchasing CHSB tokens but more importantly, keep all the key figures available and fully transparent to our community.